Boston United and Redcar Town won promotion to their respective Regional Premier Divisions with several games to spare, while Wycombe Wanderers went level on points with Southern Division 1 leaders Moneyfields. PREMIER – Haringey Borough climbed out of the drop zone for the first time after a 9-2 thrashing of basement side AFC Sudbury. ONE – Faith Green hit a hat-trick for Stevenage Reserves but Hutton went away 5-3 winners, Vicky Kinsman and Rosi Webb each with two goals. Plenty more goals as Histon took the points 4-3 at Hoddesdon Town Owls, while King’s Lynn Town narrowly beat bottom side Bishops Stortford 2-1. LEAGUE CUP Q/F – Bedford edged past Division 1 leaders St Ives Town with a Jasmine Ajayi effort, Cambridge City’s Amy Reed and Isabella Simmons scored in the 2-0 win over Colney Heath, there were four different scorers in Harlow Town’s 4-0 result against Brentwood Town, while Peterborough Northern Star were awarded the tie with AFC Dunstable and now host Bedford. PREMIER – Woodlands went level on points with fourth-placed Ollerton Town whom they beat 2-1 away with an Emily Foss winner. Loughborough Students’ Grace Stanley got a couple in their 5-1 result at Leicester City Ladies and Kier Perkins put away three in Peterborough United’s 7-1 score over Mansfield Town. 1 NORTH – A late Demi Barai double saw Boston United beat Grimsby Borough 3-0 and be crowned champions with three games to spare. Holly Newman netted three times in the opening 14 minutes in Hykeham Town’s 7-2 success at Sleaford Town which saw them jump three places to third, while Arnold Town sent Ilkeston Town to a 3-0 reverse. 1 SOUTH – The top two kept up their title race with away wins, Northampton Town 4-0 at Loughborough Foxes Vixens with an Emma Dunmore treble, Oadby & Wigston 3-0 at Corby Town with an Emma Aspinall double, while Lutterworth Athletic put four past Thrapston Town. 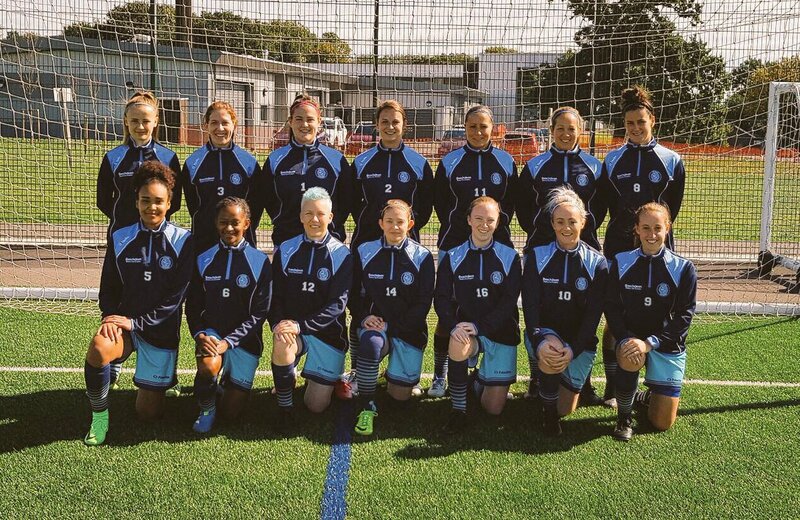 PREMIER – Kasey Kelm’s brace helped leaders AFC Phoenix defeat Eastbourne Town 4-0 and Kent Football United kept up the pressure winning 7-0 at Aylesford, where Rachel Stevens and substitute Bethany Smith both scored twice. Two apiece also for Alicia Gibbs and Emily Hart as Parkwood Rangers went down 5-0 at home to London Kent Football United, a couple as well for Emily Foss as QPR Girls Development sank Fulham 7-1. 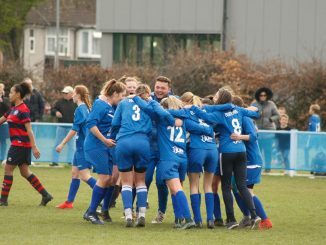 GREATER LONDON PREMIER – New London Lionesses stayed top with a 2-0 outcome at Hackney, as Ashford Town were awarded the game at Victoire. 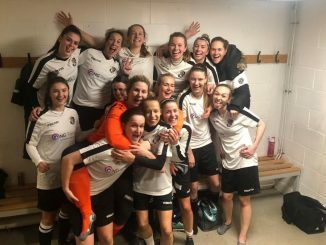 Spurs Development dented Godalming Town’s title hopes with a 2-1 defeat and Regents Park shared four goals with Watford Development as Ludovica Perinelli came off the bench to net twice for Rangers, Charlotte Bailey having got two for the Hornets. SOUTH EAST COUNTIES PREMIER – Meridian had to battle hard for a first victory of the season, Caitlin Hirst contributing twice to a 4-3 result against Newhaven. PREMIER – Two goals on the first 18 minutes at Farsley Celtic was enough for Durham Cestria to seal a fourteenth straight win. Hartlepool United’s chase was damaged in a 3-3 tie at Ryton & Crawcrook Albion Tynedale despite an Emily Stuart hat-trick, as sub Simone Laverick hit back with a brace. Elsewhere, Rotherham United lost 2-0 at home to York City. 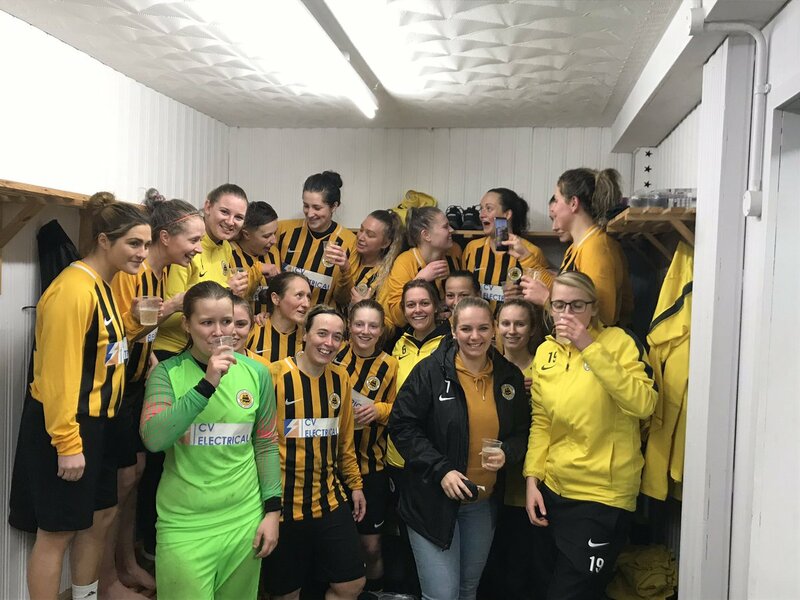 1 NORTH – Redcar Town won the title with two games still to go as Jess Round scored twice in their 4-0 win at Prudhoe Town, while Consett were held 0-0 at Washington. Larissa Burkinshaw got three goals in a 5-2 scoreline as Boro Rangers sent Cramlington United to a fifteenth defeat in a row. 1 SOUTH – Jodi Hodgson and Emma Lansdall were on track with a goal each as Harrogate Railway took the points 2-1 at York Railway Institute. PREMIER – Leaders Stockport County got the only goal of the game with Fleetwood Town Wrens for a twelfth win on the spin, title rivals FC United of Manchester sank Sir Tom Finney 7-0. Tranmere Rovers posted an 8-1 result at Penrith, Mossley Hill Athletic are fourth following a 3-1 win over Manchester Stingers, Merseyrail returned from Accrington 2-1 victors. 1 NORTH – Bury beat leaders Blackpool 3-1, their second win over the Seasiders in a fortnight. Carlisle United got all three goals of the game at Penwortham Town to maintain their own challenge for top spot, – Blackburn CSC hit Morecambe Reserves for six and Cammell Laird won 2-1 versus Workington Reds. 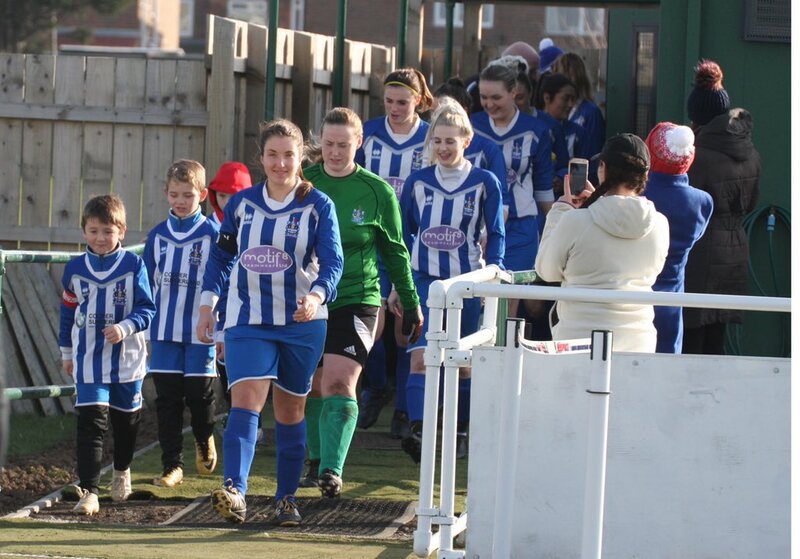 1 SOUTH – Northwich Vixens were the first to deny West Didsbury & Chorlton a win, holding them to a 2-2 tie. Chester won 5-1 against Wythenshawe Amateurs and Stockport County Blues netted a dozen at City of Liverpool. PREMIER – The only game played saw Oxford City win 2-0 at Woodley United to move six points ahead of their fourth-placed hosts. ONE – Wycombe Wanderers won 6-1 at Alton with doubles by Rachel Southby and Chante Inniss to go level on points with leaders Moneyfields but from two games more, while Abingdon United walloped Wokingham & Emmbrook 10-0 with two each for Molly Lygo-Jackson, Abbie Smith and Heather Young to keep up their hopes with matches in hand. Wargrave and Eastleigh had a remarkable 5-5 draw, Samantha Hide’s four-goal haul for the latter insufficient for all three points. PREMIER – Keynsham Town Development went four points clear with as many goals past Middlezoy, two of those for Liberty Sims. Exeter City rose to second with a strong second-half show defeating Marine Academy Plymouth 5-2, Georgie Barbour-Gresham and Sophie Gillies getting two apiece for the Grecians. 1 EASTERN – The top of the table clash ended in a 1-1 draw between Frampton and Wootton Bassett Town, Madeleine Brown with a second-half leveler for Rangers. Swindon Town Development won the local derby with Swindon Spitfires 4-0, Almondsbury beat FC Chippenham 3-0 and Cheltenham Town Development had a walkover against Trowbridge Town. 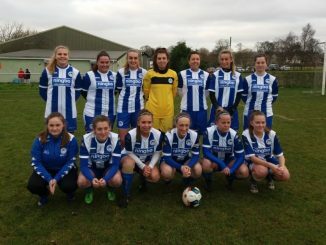 1 WESTERN – Weston Mendip leapfrogged Bude Town into fifth on goal-difference, beating them 5-1 with the aid of braces by Sherise Binns and Ellie Oritt. Elsewhere, Weston Super Mare drew 2-2 at home to St Agnes. PREMIER – Leafield Athletic and Coundon Court are just a point behind leaders Sutton Coldfield Town following wins over Redditch United (2-0) and Coventry Sphinx (1-0) respectively. Worcester United won 2-1 at Lye Town but the match between Crusaders and Knowle was abandoned at half time. 1 NORTH – Leek Town are a point away from the title with two games left after sinking Sandwell 8-2. Port Vale’s second win of the season came 4-1 over Wyrley, whom they jumped above into seventh spot. 1 SOUTH – Solihull United are six points clear with five games to play after a narrow 3-2 result against Kidderminster Harriers, the winning goal coming from Hayley Wilford. Second-placed Sedgley & Gornal United were held 2-2 at home by Rugby Town, basement side Leamington stunned Kingfisher 4-0 and Stourbridge stung Coventry City 8-1.